The study reported in the European Heart Journal focused on more than 10,000 British civil servants. The stressed had less time to exercise and eat well - but they also showed signs of important biochemical changes. The studies of Whitehall employees - from mandarins to messengers - started in the 1960s, but this particular cohort has been followed since 1985. Lead researcher Dr Tarani Chandola, of University College London, said: "During 12 years of follow up, we found that chronic work stress was associated with CHD and this association was stronger both among men and women aged under 50. "Among people of retirement age - and therefore less likely to be exposed to work stress - the effect on CHD was less strong." On the one hand, those who reported stressful jobs appeared less likely to eat sufficient amounts of fruit and vegetables, and were less likely to exercise - although problem drinking did not emerge as a significant problem in this study. Those who reported stress were also recorded as having poor "vagal tone" - the impulses which regulate heartbeat. A major part of the neuroendocrine system - which releases hormones - also seemed to be disturbed by stress, evidenced by the fact that anxious workers had higher levels of the stress hormone cortisol in the morning. "We did not find strong evidence that the effect of work stress on heart disease is worse for those in lower grades - the effect of stress was pretty much the same across different grades," said Dr Chandola. "However, later on in the study, some parts of the civil service underwent considerable change in their working environments, including privatisation. "We are currently exploring whether the effects of these changed work stress levels, partly brought about by privatisation, are particularly deleterious for those in the low grades of the civil service." 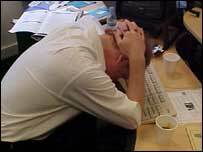 The British Heart Foundation said the research added to our understanding of how stress at work may alter the body's chemistry. "The study also reinforces what has been identified by previous research, that stress at work is often associated with unhealthy behaviours such as smoking, lack of exercise and a poor diet - all which can impact on heart health," said June Davison. "There are many ways that we can help ourselves by learning how to cope with stressful situations. "Keeping fit and active also helps to relieve stress and therefore reduce the risk of heart disease."